Our protagonist and hero, as it were, is Hercule Poirot, a very talented detective and Belgian police officer who has already retired. We meet him as he is taking the Taurus Express which is going to travel to Stamboul (now Istanbul). Poirot takes particular notice of two other people on the train. Mary Debenham and Colonel Arbuthnot act as if they are strangers, but Poirot can discern that they display behaviors which suggest that they are not. He becomes suspicious of them. After the train arrives in Stamboul, Poirot checks into the Tokatlian Hotel where he immediately receives a telegram asking him to return to London. In his brief time at the hotel, Poirot runs into an old friend, one M. Bouc, head of Wagon Lit. Poirot is able to secure a space on the Orient Express courtesy of M. Bouc. In the dining room of the Takatlien hotel, Poirot takes notice of Ratchett and Hector McQueen together at dinner. Poirot describes Ratchett as an evil man and an animal. Once on board the Orient Express, Poirot is forced to ride in a second-class cabin since the train is completely booked. Soon after, Ratchett and McQueen board the train, and Ratchett asks Poirot to work for him. Ratchett explains that he has been receiving threatening letters and he believes someone is plotting to kill him. Poirot refuses. M.Bouc takes the last fist-class cabin but he arranges to move to a different coach, so Poirot may take his first-class cabin. The fist night on board the train, Poirot observes numerous strange events in the night. Early the next morning Poirot is jolted awake by a cry from Ratchett’s compartment. The conductor checks on Ratchett and when he asks if everything is alright, a voice from within says “Ce n’est rien. Je me suis trompe” (It is nothing. I am mistaken). Poirot has trouble sleeping due to the strange silence on the train. Mrs. Hubbard alerts the conductor to tell him there is a man in her room. Poirot also calls for the conductor and he is told that the train has become stuck in snow. It is at this moment that Poirot hears a loud noise from next door. The train remains stopped in the morning, and M. Bouc tells Poirot that Ratchett has been murdered. What is more, the murderer must still be on board the train. Poirot proceeds to examine the crime scene and the body of Ratchett. He sees that there are twelve stab wounds in Rathcett’s body. 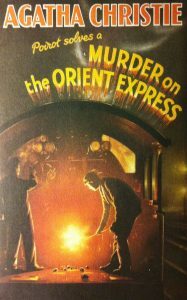 The window had been left open in his compartment, which Poirot concludes was designed to make investigators believe the murderer had escaped out the window. The last clue helps Poirot figure out who Ratchett really is and provides a motive for someone to want to kill him. Some years prior, a man named Cassetti had kidnapped a three-year old girl named Daisy Armstrong. Cassetti received the ransom for the return of Daisy, but he murdered her anyway. In connecting these two facts, Poirot concludes that Ratchett was in fact Cassetti. Poirot begins conducting interviews with the passengers on the train. Beginning with the Wagon Lit conductor. He proceeds to McQueen who Poirot knows is connected to Ratchett since he admits that he is surprised they found the note. He thought it had been destroyed. Poirot then interviews Masterman and Mrs. Hubbard, the latter claims that the murderer had been in her cabin. After the interviews, all passengers provide alibis, yet suspicions things remain. Many people claim to have seen a woman in a red kimono in the hallway the night of the murder, yet no one admits to having such a thing. Mrs. Hubbard explains that she instructed Greta Ohlson to look the communicating door between her cabin and Ratchett’s. Hildegarde Schmidt claims to have bumped into a stranger wearing a conductor’s jacket. Poirot inspects the luggage of every passenger. He makes a few discoveries. The label in countess Andrenyi’s luggage appears to be wet. He finds a conductor’s jacket in Hildegarde Schmidt’s luggage. Finally, he discovers a red kimono in his own luggage. Soon after this, Poirot, Dr. Constantine, and M. Bouc convene to review the evidence and facts. From this Poirot develops some questions and retires to think things over. When he emerges form this, he seems to have solved the case. Before he reveals his conclusions, he calls in several people in order to reveal their real identities. Poirot finds out the Countess Andrenyi is really Helena Goldenberg, the aunt to Daisy Armstrong. She deliberately got the label on her luggage wet to obscure the name and her identity. He also discovers that Antonio Foscanelli was Armstrong’s chaffer, Masterman her valet, and Greta Ohlson her nurse. Princess Dragomiroff is offered a handkerchief as if she had lost it, and Poirot finds it to be the same as the one found on Ratchett’s compartment. At this stage, Poirot assembles all of the passengers in the dining car. He proposes two possibilities for the case. The first is that a stranger entered the train somewhere around Vincovci, murdered Ratchett, and escaped. The second, more plausible solution is that everyone was involved in killing Ratchett. He makes the case that the twelve people assembled all worked together to kill Ratchett in order to avenge the murder of Daisy Armstrong. With this, Mrs. Hubbard admits that she is really Linda Arden, and that this second solution is what actually happened. Poirot suggests that M.Bouc and Dr. Constantine go ahead and tell the authorities that a stranger boarded the train and committed the murder. In the end, they agree to protect the family from prosecution.